Zirconia Ceramic – Zirconium Oxide ceramic has high resistance to corrosion is a very hard and durable material, with low thermal conductivity, high strength and flexibility. 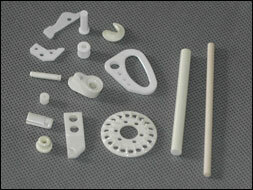 Because of certain additives, Zirconia Ceramic – Zirconium Oxide ceramic material has a higher melting point than Alumina. Zirconia Ceramic – Zirconium Oxide is used in oxygen sensors as well as other technical applications.